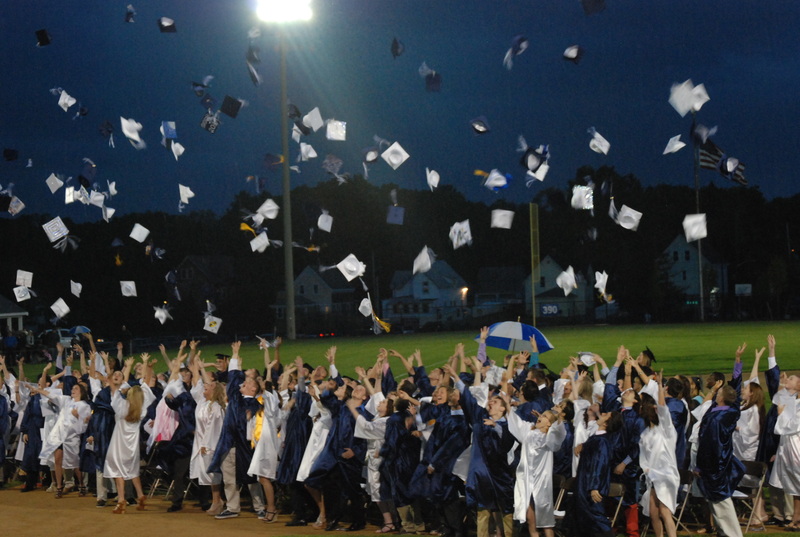 Over the past year the Rockland High School community has been exposed to both triumphs and tragedies. Overall, 2014 was action packed for both RHS and the outside communities, and the Veritas was there to report it all. RHS kicks off the new year with visits from past graduates. Members of the Class of 2013 return to talk about their colleges and pass out information. Pop Culture teacher, Brian Smith proposes experiment for his students, no cell phone use for 24 hours; the only exception being important phone calls. RHS art classes traveled to Boston for annual Globe Show. Students Georgia Panagiotidis (Gold Key), Dani Hill (Silver Key), and Joey Marchetti (Honorable Mention & Silver Key) are recognized for their artwork and photography in the annual art show. After being hit with increased gas, electricity, and special education costs and having a reduction of state funding and federal grants, the Rockland Public School District asks for a budget override. Voters at the town elections defeat the request. RHS girls lacrosse finishes its very first season and the boys finish their first season as a varsity team. On Saturday, April 5 the Lakeview Pavilion in Foxborough was completely destroyed by fire. The Pavilion had been booked for the RHS Senior Prom on May 28. The first thing that most seniors thought was “where is our prom going to be?” They chose the Red Lion Inn. Left to right are juniors Nicole Cook, Dennis McPeck, Eddie Yeadon, Kara Penney who were selected to represent RHS at Boys and Girls State. “This group of girls accomplished something not many teams can do. 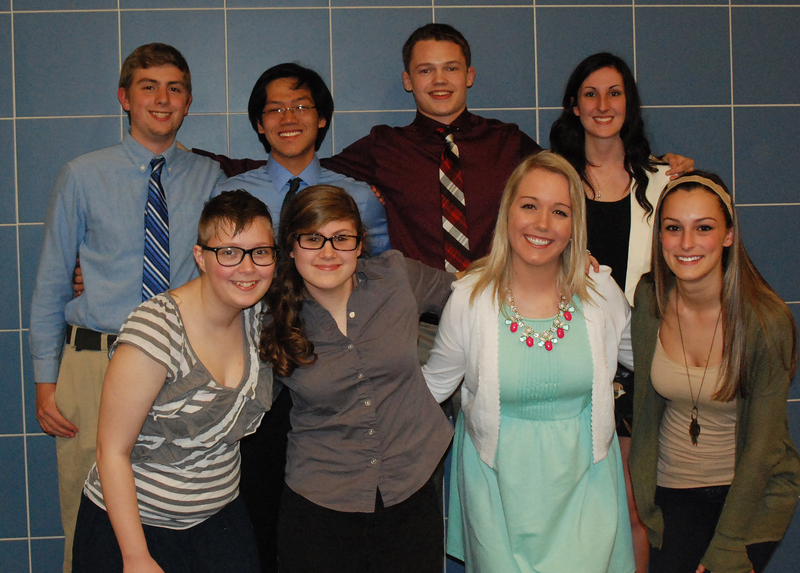 This team, and especially these seniors will forever be legends in our school,” said Coach Greg Rowe. On Monday, December 22 Rockland High School graduates returned to RHS to visit with teachers and students at the second annual college fair. The graduates shared information with students about the colleges and universities that they are attending and passed out brochures to those who were interested. Junior Meghan Foster, who serves as the RHS Student Government Council Student Services Chair, organized the event with Head SGC Advisor, Kristen Walsh. Jackie Carlson shows some Framingham State Ram pride. 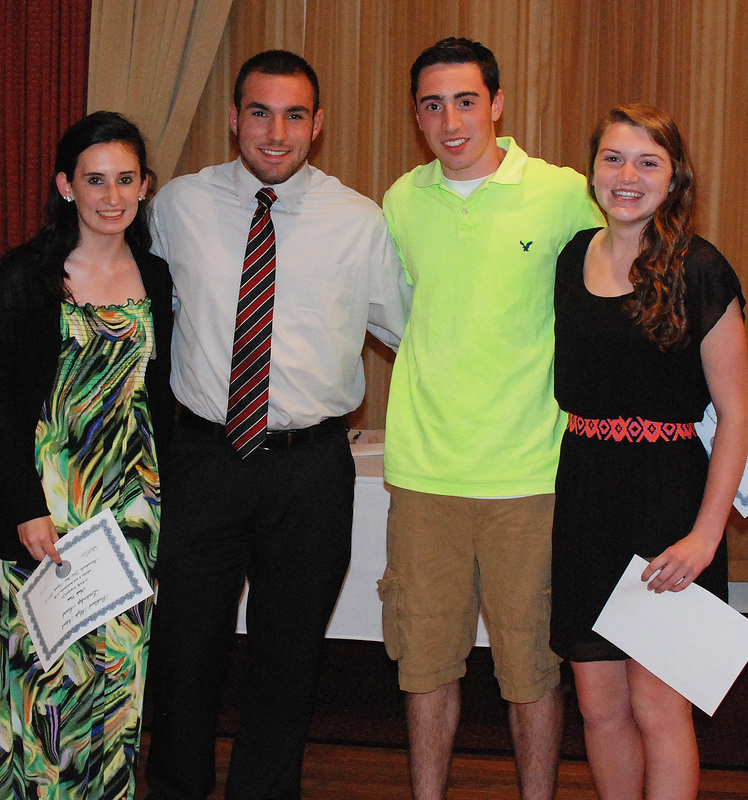 At Monday night’s School Committee meeting a group of students were recognized and presented with achievement awards. 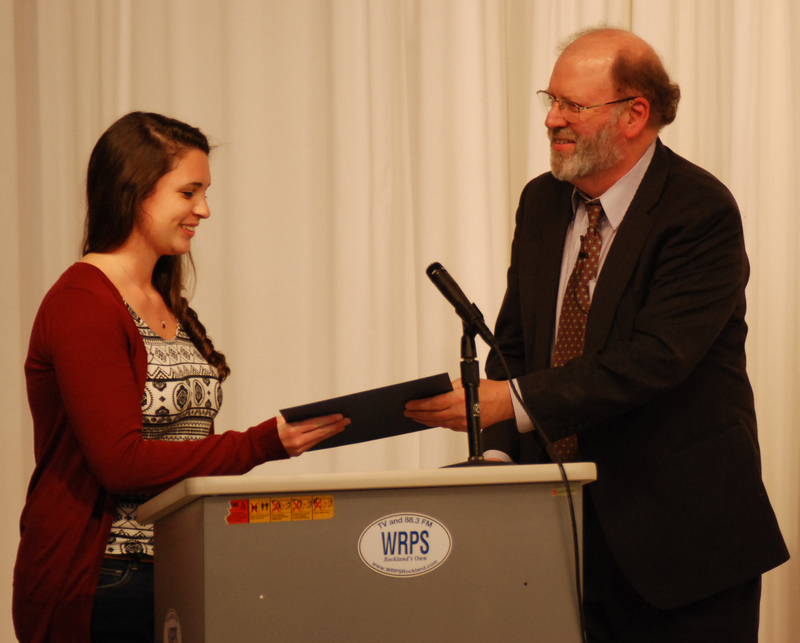 Senior Alyssa Collins was presented with the Massachusetts Association of Superintendents’ Academic Award by Superintendent John Retchless. 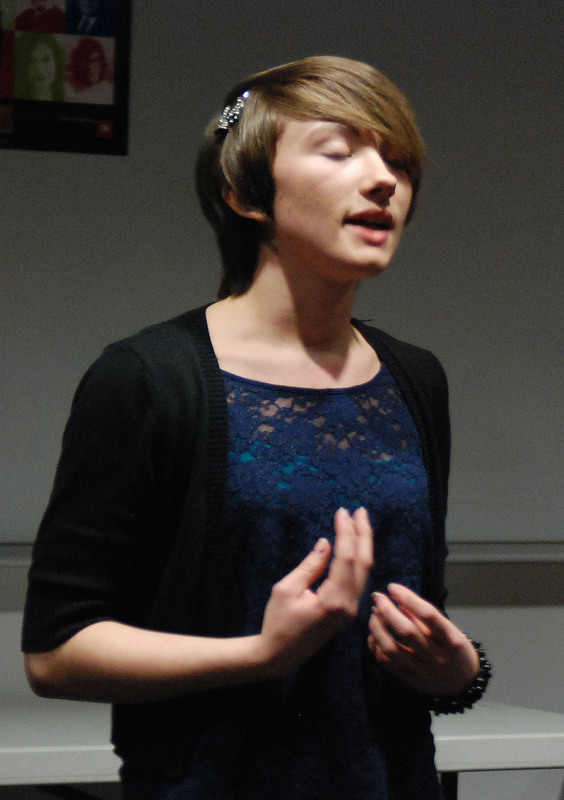 Retchless asked Collins to talk about her academics present and future. She said she participates in band and theater guild. Collins would like to attend Brown University to study psychology. She is one of the top students in the senior class. 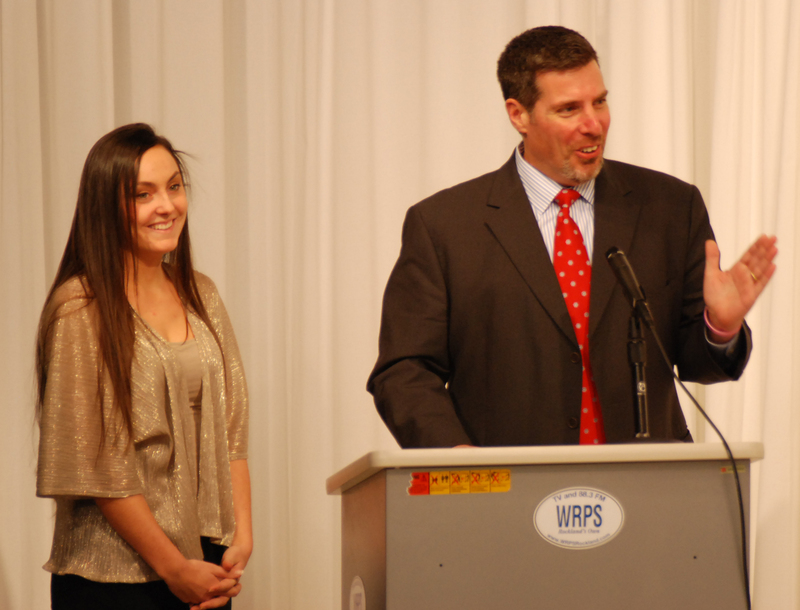 Senior Alexandra Pigeon was awarded the Massachusetts Secondary School Administrators’ Association Student Achievement Principals’ Award by RHS Principal Alan Cron. Dr. Cron talked about Pigeon’s excellent academic record and her involvement in sports and extracurricular activities. Pigeon says that she is honored to have been recognized by Dr. Cron for her achievements. She has applied to several colleges and would like to major in English, writing or Journalism. 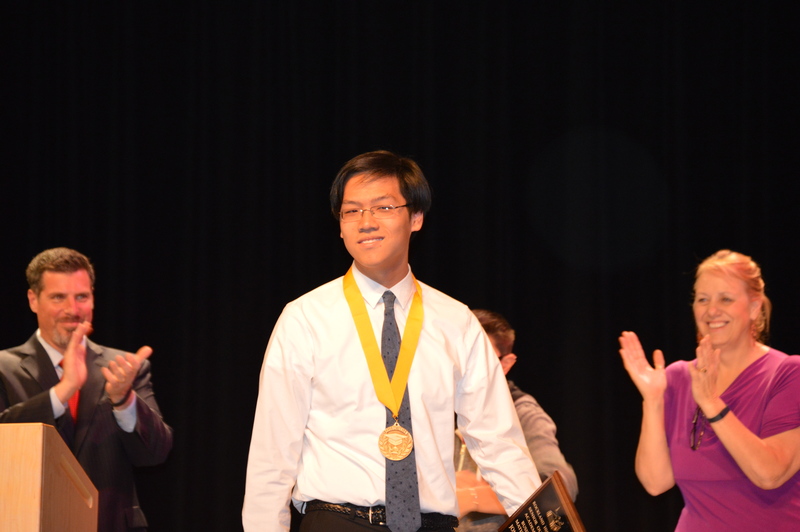 Pigeon is a co-editor of the Veritas, the high school newspaper and is also one of the top two students in the senior class. 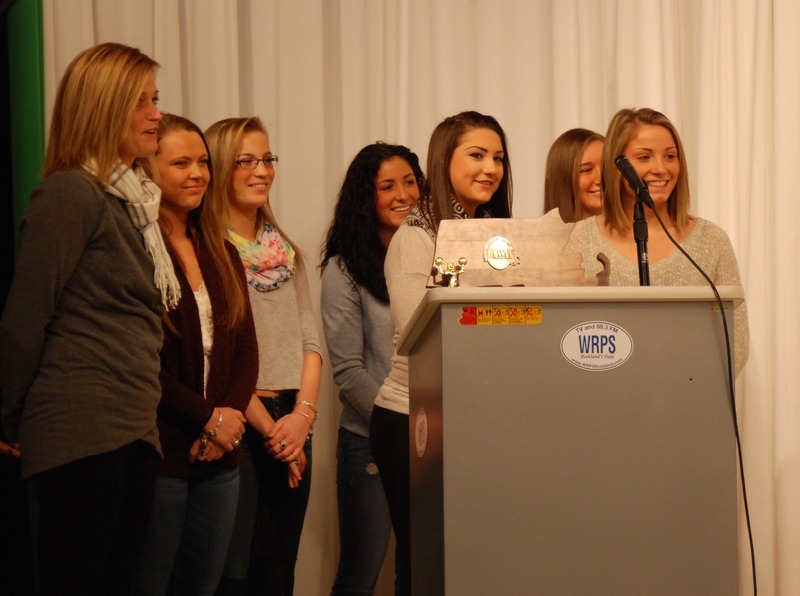 The Rockland High School Cheerleaders were also recognized for winning the State Championship in Division 4. 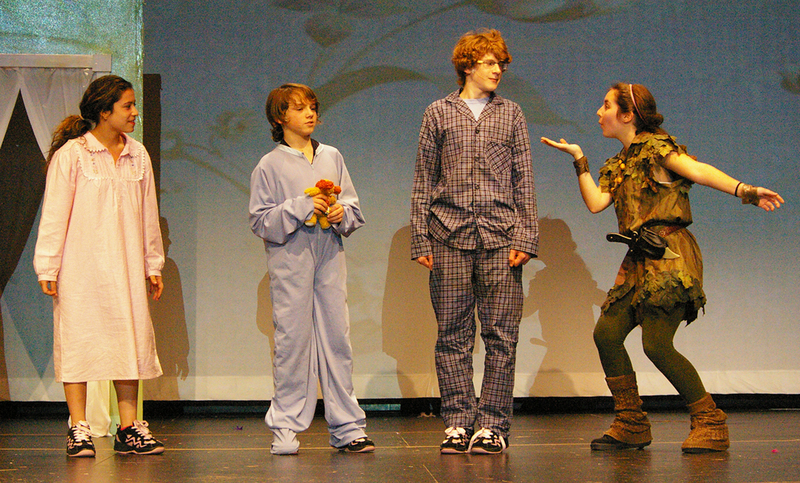 Those who attend the Theater Guild’s first production of the year this weekend will be taken to Neverland along with the cast of Peter Pan. The show will go on at 7:30 pm on Friday and Saturday nights, Dec. 12 and 13, and at 1 pm on Sunday afternoon, Dec.14, in the RHS Auditorium. 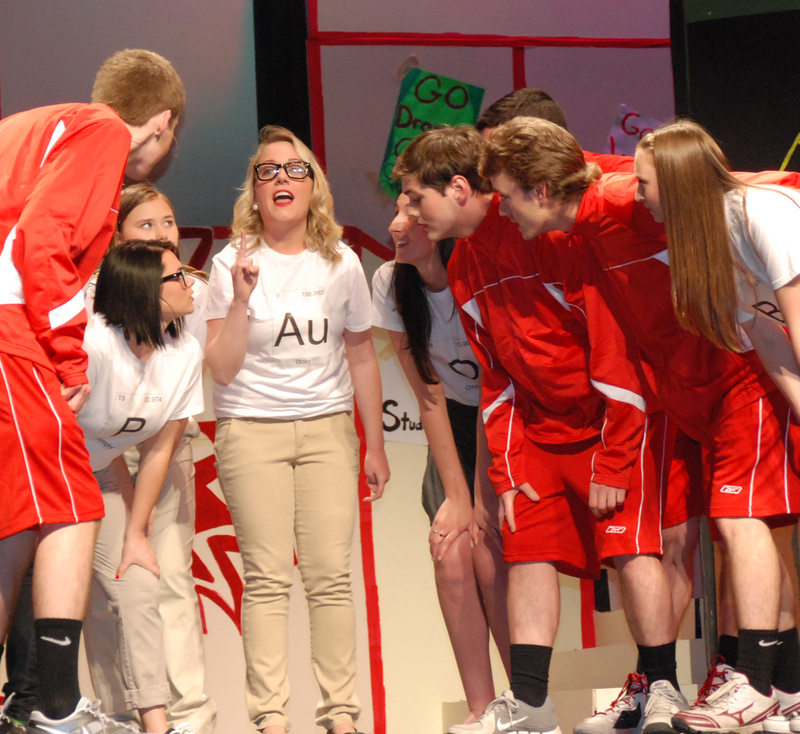 Theater Guild director, Jennifer Hartnett says that her large cast is ready. Last night’s two dress rehearsals featured two different casts made up of Theater Guild members who changed roles, as they will in the upcoming performances this weekend. 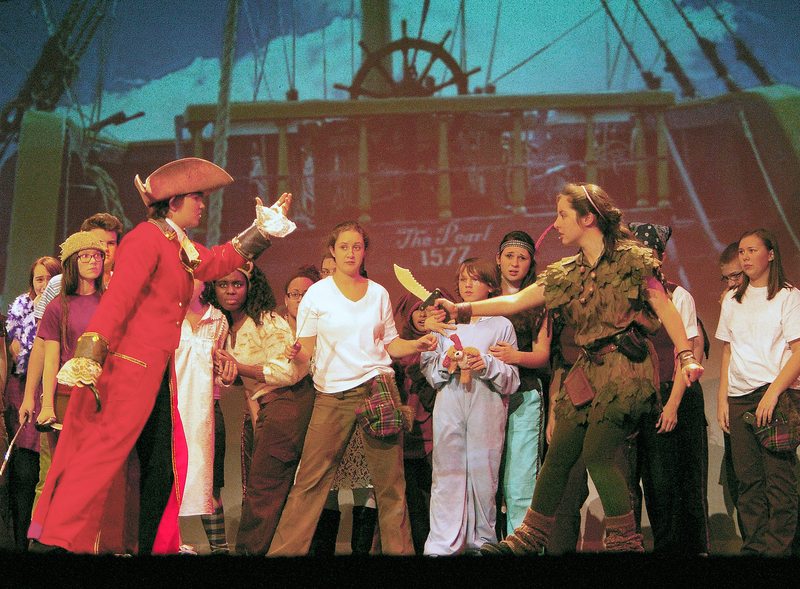 Peter Pan will be played by Stephanie Blaney and Sophie McLellan; Alyssa Collins and Jurnee Dunn will share the role of Tiger Lily; PJ Butler and Leah DeCecco will play Captain Hook; Chris Landy and Danielle Hill will be Smee; and Ella Engle and Genesis Rojas will share the role of Wendy. Tickets can be purchased on showtix4u.com for $7 in advance and $10 at the door. For a preview of the show go to the Veritas’ Club/Activities page. 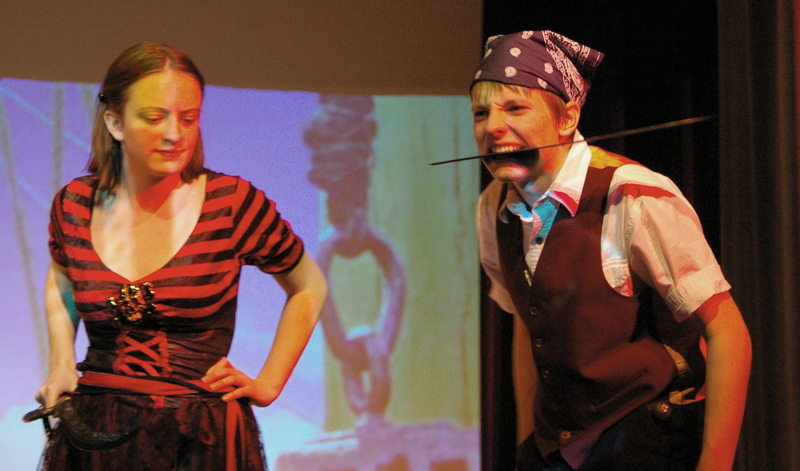 PJ Butler and Ella Engle played pirates in the second rehearsal; Butler also plays Captain Hook while Engle will also play Wendy Darling in the weekend performances. Coach of the Aussie Travelers, Rad Radon, instructs his players during a time-out. 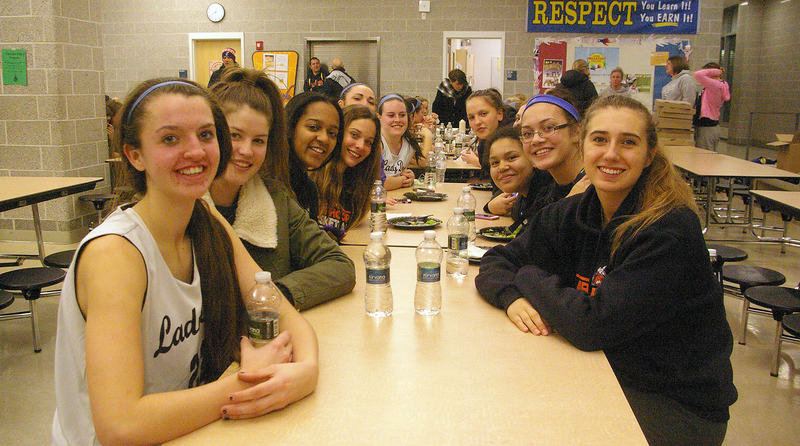 The Rockland girls basketball team hosted their first scrimmage Monday, but it was no South Shore League foe, or one in the same hemisphere for that matter. The team they played is known as the Aussie Travelers, a high school team from Australia who makes a two-week journey to the United States bi-annually. This time around, the travelers are touring Massachusetts and New York before heading out to Los Angeles. The girls (and Aussie boys team that travels with them) have had quite the busy schedule since coming across the world. They toured Syracuse University before playing Rome (N.Y.) High School and also toured World-Famous Fenway Park before heading down to Rockland. For their time in Massachusetts, the Aussies have been staying in Cohasset thanks to a family that lived in Australia before moving to Massachusetts. 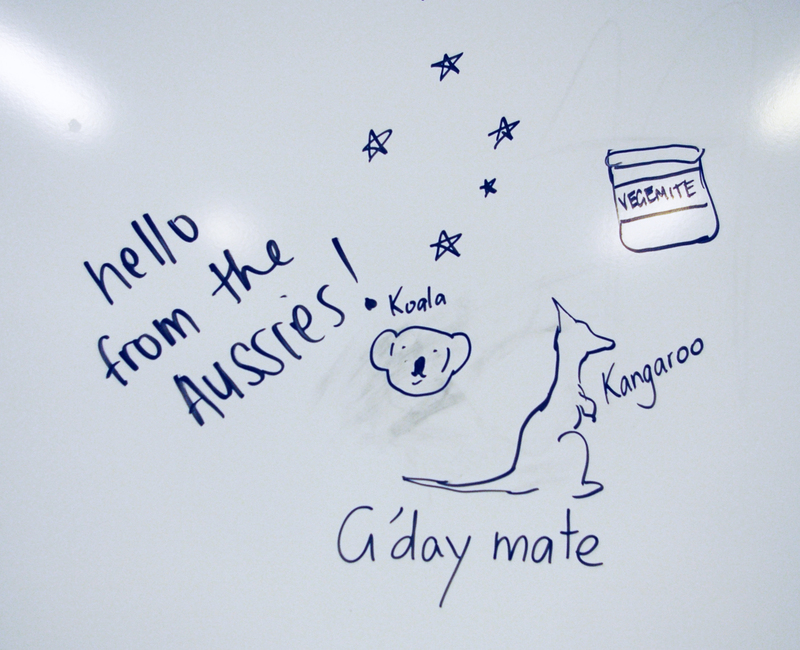 The Aussie girls left a message in the locker room before their scrimmage with the Rockland JV and Varsity teams. Rockland players and Australian players from St. Luke’s in Sydney got together after the scrimmage. The Aussies will be on the road to Los Angeles when they leave Massachusetts. They will visit Disneyland out there as well as visiting the Staples Center for a Lakers game and Pauley Pavilion to see UCLA. As for the game, it was a 5-quarter scrimmage that the Lady Dogs unofficially won 59-40. The key to Rockland’s success was their suffocating full-court press and their basket penetration and overall aggressive play. 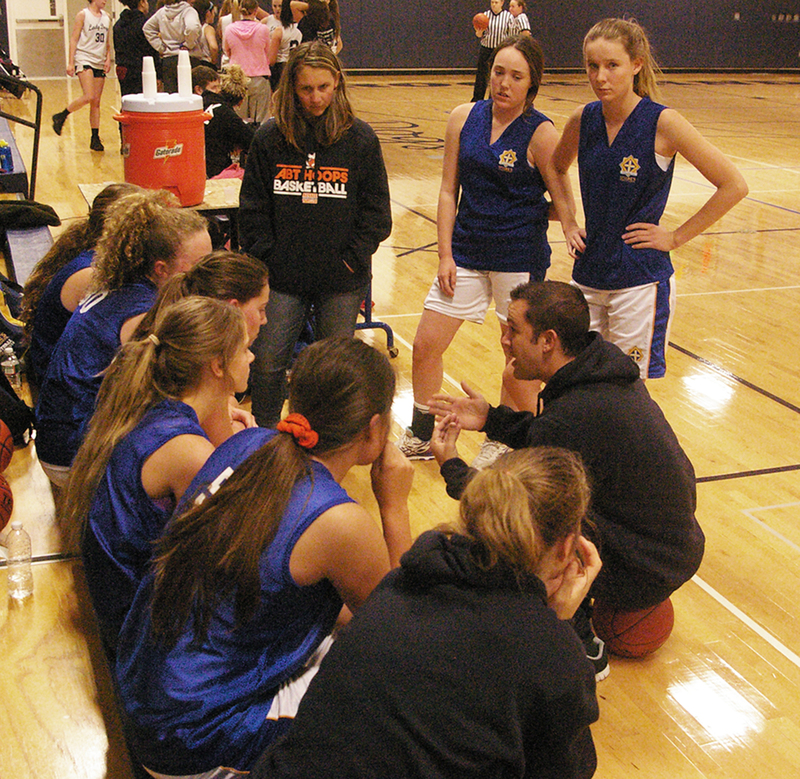 The Rockland girls open their season on Friday, December 12th, at North Quincy High School. “We are all immigrants,” says Susan Patton, Alternative Program Director at Rockland High School. Mrs. Patton along with English teacher, Kendra Donovan and their students in the Transitions class are creating a project called Faces of Rockland. 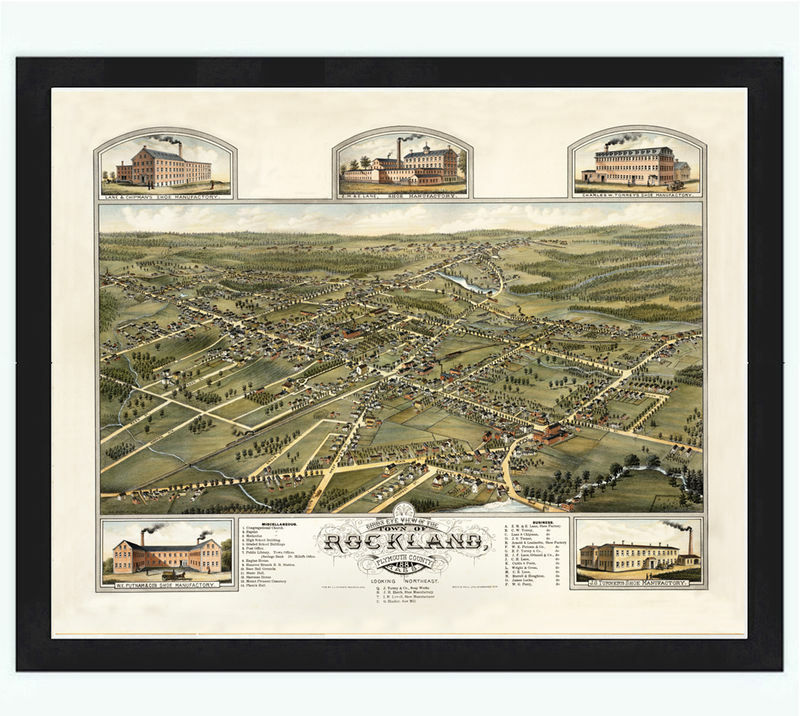 The project, supported by a grant from the Rockland Education Foundation, is “dedicated to exploring the history of Rockland, and the journeys that brought its residents here,” according to the group’s Facebook page. Their discoveries will be going into a book and documentary to be published in the spring. The producers are searching for Rockland residents who have immigrated to the town in the past three generations who are willing to share their stories or the stories of their relatives. “This would be for those families that can trace their heritage back to coming to this country, whether one, two, or three generations ago, and know the story of their arrival,” explains Mrs. Patton. The Transitions class would like to interview fifteen or more people in the upcoming weeks. If you are interested in the project or know someone who would be willing to be interviewed, contact Mrs. Patton at Rockland High School at spatton@rocklandschools.org or go to their website for more information. The Rockland Bulldogs football team renewed their Thanksgiving rivalry with the East Bridgewater Vikings on Thursday morning. The game was a hard-fought one that came down to the final minutes although the 29-12 final score wouldn’t indicate it. The Vikings scored twice in the final 10 minutes to fend off the Bulldogs for their seventh straight Thanksgiving Day victory. East Bridgewater (9-2, 6-2 SSL) scored midway through the second quarter, a 45-yard pass play from Ryan Graham to Jake Peterson, to break the scoreless tie. Rockland (6-5, 5-3 SSL) answered on the next drive when Joe Reardon completed a 46-yard pass to Liam Ball to set the Bulldogs up at the 2 yard line. On the next play, Joe Reardon kept it himself and ran in the 2-yard touchdown but then was unable to punch in the 2-point conversion, leaving East Bridgewater with a 7-6 lead at the half. An interception by the Vikings’ Brandon Hunter set up East Bridgewater in Rockland territory before junior running back Jared Vargas scored on a 16-yard touchdown run, making it 14-6. Once again, Joe Reardon had the answer, scoring again on a 12-yard run for his second touchdown in his last football game, cutting the Viking lead to two at 14-12. After a personal foul kept the next Viking drive alive on a fourth down play, quarterback Ryan Graham leaped over the Rockland defense at the 1-yard line to score, extending East Bridgewater’s lead to 21-12. Owen Harrington capped the scoring in this game, punching in a 6-yard touchdown with just over two minutes left in the game. The Vikings lined up for a conventional point-after attempt before quarterback and ball-holder Ryan Graham rolled out and hit Connor Gavin with a 2-point completion, making the final score a 29-12 East Bridgewater victory. Click here for the Veritas photo gallery of the senior football players and cheerleaders before the game.